As you know, Marisa and I are in the process of moving in together (well, I'm moving a selection of my crap into her place) and so our newest project was born. I give you Newly Cohabitating: Episode 1. Yes, we've started an audio podcast! If we do it again we'll launch a blog and all that good crap. Give it a listen (it is about 10 minutes long) and let us know if you want more. Hey, you, make deviled eggs! The newest Fork You is up! We make deviled eggs in 2 minutes, and they were tasty. Check out the whole thing, and why not subscribe to our podcast in iTunes? Hmmm? Where are you going to be this Saturday at 2pm? You should have at Foster's on Market and 4th in Philadelphia to attend a taping of Fork You Live, America's favorite cooking podcast starring myself and Marisa. Why should you come? Well, other than the fact that it is a hoot, we'll give you some brownies, blondies, or rice crispy treats. What is not to like about that? Another episode of Fork You is up for your enjoyment! This time around we made three kinds of Mac and cheese. This episode also marks the first Fork You ever that I didn't edit myself. I'll admit it was a little tough to let someone else work on my baby, but I think you'll agree that Vincent did a great job with the material. Don't forget that there is yet another Fork You Live this Saturday at Foster's. All the details are here. We'll be making brownies, blondies, and rice crispy treats! Be there, or you don't get a square (see what I did there?). I just realized I never posted our latest Quick Fork, Stock Up! Here it is. So, what do you think of these short 2 minute episodes? Are they a good idea? Should we continue doing them? Let me know in the comments. Clearly, Huckabee is not presidential material. I mean, what kind of man stands idly by as his wife's head is being stolen by an unseen assailant? That's how much you get from 8 pounds of change (your results might vary). 1,101 coins! Ah, if only I had ten more coins in there, that would have been awesome. My only question is: how the heck did I end up with so many dimes? I have an uncanny ability to collect staggering amounts of change in short order. Until recently, most of that change ended up scattered across my apartment: on the floor, on top of the fridge, in the cushions of my sofa, on top of the TV... you get the idea. Marisa put a stop to all of that (she demanded that I start putting my change in a bowl, before we were going out even! Shortly thereafter I started putting my change in a bowl). I have collected just under 8 pounds of change. I'll wait as you read that again. Yep, you read that correctly: 8 frickin' pounds of change. 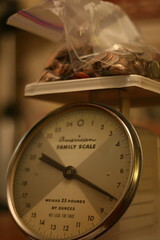 The question is, how much money does 8 pounds of change translate to? That question is difficult to answer since the mix of change can't be determined (8 pounds of silver dollars, one imagines, would be worth more than 8 pounds of pennies), but it is still fun to guess! I'll be cashing in my change tomorrow morning and posting the amount that I get in the afternoon. My guess is somewhere in the neighborhood of $85. Marisa says $23 (she so totally wrong). What do you think?